I thank you for your polite reply regarding my article; but I disagree to your idea that using the name “Church of God” can be pretentious, if you are in the true Church. In fact, the apostle Paul did not, in any manner, felt pretentious when he said the following statements in 2 Thessalonians 1:4. Those that are of the world are of the world; and they listen to their own. Those that are of God listen to God. No amount of suspicion from the world can stop them doing so. When God said that anybody who uses His name in vain will not be held guiltless, God does not mean that we can not use His name anymore. When the Bible said that enemies of God use the name of God in vain, it does not mean that everyone that will use the name of God is an enemy of God and using God’s name in vain. Are we going to refrain from using the name of God if we sincerely know in our hearts that we are using it in accordance with God’s will in the Bible? God Forbids! Let us be true to ourselves and to our conscience. 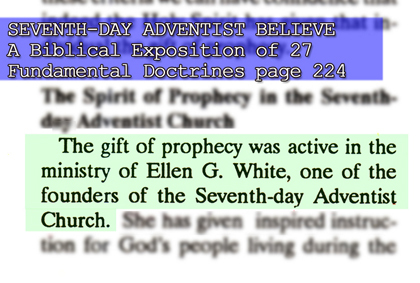 The Seventh Day Adventist Church was founded by man, and its name, as you have said, is their option — not of God. (1 Timothy 2:11-14) “But I suffer not a woman to teach, nor to usurp authority over the man, but to be in silence. And Adam was not deceived, but the woman being deceived was in the transgression. This entry was posted in atheist, belief, bible, book, christianity, Church, faith, God, heaven, Jesus, life, religion, seventh day adventist, spirituality, truth. Bookmark the permalink. I agree with you. For the most part. For the record, I don’t think it’s being pretentious, no more pretentious than calling the Bible the Book or Word of God. I was just saying that the founders of the church thought it might be construed as pretentious, as if to say all the other Christian denominations are not of God. I think that’s what the founders of the SDA church had in mind when they named the church. They wanted anyone and everyone to know the Saviour and didn’t want to offend any of the other churches. And, as far as your comment about “the Seventh Day Adventist is not the true church because it was founded with the leadership of a woman which is against God’s will in the Bible,” I think it takes a very marginalized view of what God can do with the people who make themselves available to Him. Because while 1 Timothy certainly does say “I suffer not a woman to teach, nor to usurp authority over the man, but to be in silence,” it cannot be taken as the golden standard by which all women must be measured and kept. If we take just particular passages of the Bible and quote them, we can make any case for any topic. But taking it as a whole, we can see a much broader picture in which women can be leaders. May I direct you to the Book of Esther, a story about a woman who does NOT remain silent? Or Joshua 2, in which the prostitute Rahab saves the lives of the Israelite spies by hiding them, a story in which she very much tells them what to do? The list goes on and on. There are not many women in the Bible, but those that are, are leaders in some form or fashion. I’m not trying to start an argument, but I find it incredibly ironic that this “debate” started over the idea of Christian pretentiousness. We’re glad that you are taking time to read Bro. Eli’s articles. We encourage you to read more for you to have an idea about the real doctrines of Christ. Regarding your statement about women whom you perceive & mentioned to be leaders in some form or fashion, it is clear that these women did not establish their own Church neither had authority over men. Although they did support the men of God as recorded in scriptures, but they did not usurp authority over men. But it is not the same case with Ellen G. White. She was one of the founders of the SDA Church, therefore nullifying the authenticity of that Church. Bro. Eli’s statement was precise, I hope you got the point. What happen if Adam refuse her wife? What happen if Pilate agreed her wife? Before, i have the same thought that a single passage in the scriptures won’t stand alone to prove a whole organization of one to be wrong. Therefore, i always look for another passages to support the other to feel better. But this is not the case with the words of God. When you have read from the bible, “honor your father and your mother”, It doesn’t need one or more passages for us to believe it. The same way when it’s written, “but i suffer not a woman to teach nor to usurp authority over men but to keep on silence”. All we need to find is why it is forbidden. May be some women may be instruments to teach or to usurp authority over men in some areas of services to God, but her teachings must be under the guidance of one send by God because He gives words to men not to women. The hierarchy of organization in the Church of God must follow what is being written in the bible, like, God is the head of Christ then Christ is the head of man and man is the head of woman. I believe that God commandments flows in this manner. So? I am not Eve! “I was just saying that the founders of the church thought it might be construed as pretentious, as if to say all the other Christian denominations are not of God.” – Scott Fogg. Indeed, Scott was mislead by those who do not consult the bible thoroughly! An example of those that only leaning on their own understanding. written in the bible for christians. 1 JOHN 1:3That which we have seen and heard declare we unto you, that ye also may have fellowship with us: and truly our fellowship is with the Father, and with his Son Jesus Christ. SCOTT,did you notice those verses?it is through the things written….that we can have fellowship with our LORD CHRIST AND THE APOSTLES AND THE FIRST CHRISTIANS.They saw….heard…and declare!can we be above those things they do proclaim to us? AND SINCE WE CANT BE ABOVE THOSE THINGS WRITTEN,…..then we should abide to what the bible say about christianity. the church that the christians profess is THE CHURCH OF GOD…..for it is the house of the LIVING GOD. AGAIN,IF BROTHER PAUL,THE APOSTLE TO US GENTILES was called in the CHURCH OF GOD….IT IS BECAUSE OF THE REASON THAT IT IS THE CHURCH WHERE PEOPLE WHO WANT TO SERVE GOD ARE CALLED. but they became followers of that one church. IT IS THE CHURCH TAUGHT BY THE EARLY CHRISTIANS THAT WE CAN HAVE FELLOWSHIP WITH CHRIST AND THEM…is there any problem if we join that one church? can anyone just build a church for GOD?REMEMBER….THAT CHURCH IS THE ONE CHURCH……AND IT ALREADY FOUNDED BEFORE WE WERE EVEN BORN……BUT THE WICKED…..NONE OF THE FALSE TEACHERS WILL UNDERSTAND…..DAN 12;9-10…AND FOR NOT UNDERSTANDING…IT MANIFESTED IN THEIR WORKS……..WHAT DID THEY DO?THEY FOUNDED THEIR OWN…BEING IGNORANT OF GOD’S RIGHTEOUSNESS. ROM 10:2For I bear them record that they have a zeal of God, but not according to knowledge. HOPE TO HEAR FROM YOU SCOTT,and may you be enlightened more by brother eli’s reading of the gospel…we were once blind…but now we can see!!!!!!!!!!! !GLORY TO GOD AND TO THE BROTHER ELI,THE MAN HE SENT FOR US….TO FIND GOD!!!!!!!!!!!!!!!!!!!!!!!!!AMEN!!!!!!!!!!!!!!! THERE’S ONE CHURCH…..WE JUST NEED TO BE PART…..TO BE MEMBERS OF THAT ONE BODY!WE CANT BUILD OUR OWN…THATS REJECTING CHRIST. Bro. Eli is SIMPLY AMAZING! To our friend Scott, don’t hesitate to ask more questions regarding faith. It is the obligation of every Christian especially the “ONE” sent by God to answer every question being asks of him by anyone seeking God. I believe Bro Eli will not just post verses upon verses but will expound these verses to the delight of every open-minded individuals. can you please explain what you meant in your response? how you responded to my quote doesn’t make sense to me. what church, exactly, should they have joined in the mid 1800’s? you say they made their own church instead of “that one church. For Christians . . . Written in the Bible.” But if my memory of history serves me correctly, at that time there was no church denomination that was following the Bible wholly. Thanks, everyone for being so friendly and allowing me to ask these questions! Anyhow,year 1800 is past and we are in the 21st century now.the q.you posted is academic for we were not around during that time to search for truth…the time is NOW!If you’re reading the bible…and guided…this verse wont escape your scrutiny…. AS we can see,the book has been sealed…..until when?WHEN IT IS THE TIME OF THE END…..and how do we know that IT IS THE TIME OF THE END?IT says clearly in the verse…….WHEN MANY SHALL RUN TO AND FRO,….AND KNOWLEDGE IS INCREASED!it is great that we have come to the computer age….that time when knowledge is increased!and the time of the end….when the book shall be opened….BUT TO WHOM SHALL IT BE OPENED? again ,as the verse says…THEY that be WISE….SHALL SHINE AND TURN MANY TO RIGHTEOUSNESS….. If you’re reading the bible…and guided…this verse wont escape your scrutiny…. again ,as the verse says…THEY that be WISE….SHALL SHINE AND TURN MANY TO RIGHTEOUSNESS…..isnt this our hope? but who is the wise?that will turn many to righteousness? IF you examine the verse closely…..that WISE man….is HE THAT UNDERSTANDS!the q. is….can every man understand the WORD OF GOD? IT says…NONE OF THE WICKED SHALL UNDERSTAND……..BUT THE WISE SHALL UNDERSTAND…. and from these verses we can carefully qualify those preachers who founded their own church…..ROM 10;2-3 A REALIZED PART OF THE PROPHECY! THEY FOUNDED THEIR OWN FOR BEING IGNORANT OF GOD’S RIGHTEOUSNESS. And reiterating again….there’s one church….that one body….where people are called to be saints……THE CHURCH OF GOD…..2 COR 1;1,1 COR 1;1-2,acts 20:28,1 thess 2:14…. if you will scrutinize very closely…..who understood ?are they those who founded their own ??? or isnt he who abided to things which were written? AND THERE’S ONE CHURCH …AND THAT’S THE BIBLICAL CHURCH THAT BRO.ELI IS PREACHING ABOUT.AND I CAN NEVER DENY THE TRUTH THAT BRO ELI IS SPEAKING…..FOR THEY ARE WRITTEN!!!!!!!!!!!!!!!!!!!!!!!! !TO GOD BE THE GLORY!!!!!!!!!! SHOULD WE JOIN UNFOUNDED CHURCHES?OR JOIN ”THAT ”WHICH IS WRITTEN?……………………. again…thanks scott for taking time with us.May you find truth IN GOD’S WORD. But I don’t understand why you criticize the founders of the SDA church for starting up a church that they felt followed the Biblical doctrines closer than other church organizations were doing at that time. While yes, that is the past, it was the present for them. And the church they created is still trying to follow God’s will as He has made it known through Scripture. I am searching for the truth. Every day I seek God’s guidance in all matters. I don’t see how or in what way you can belittle another church fellowship. we don’t belittle …We are just trying to open your eyes to seek for the truth.You can never seek the truth if you are offended thee.In knowing the truth wether it offened or not.It’s the truth .It has bases, you can never believe a certain matter when it has no basis. Yes there are woman who had been used as an instrument to adhere what’s stated in the gospel. But are they leaders,angels and prophets? Hi Scott! Hope your search for the truth leads you to God. [i]I love them that love me; and those that seek me diligently shall find me. Granting that in those years (1800’s) The Church of God was nowhere to be found but that does not necessarily mean that it doesn’t exist because the composition of The Church of God is not only people but also the doctrines, the apostles, the prophets, the angels, Christ and of course God. (Bro. Eli can explain it much better, I have just given you some hint). It will not also grant Ms. E. White the permission or authority to build another church for it was already in existence. Now let’s fast forward to the 21st century, you opened your eyes and you found yourself in the religion or in the faith of the SDA’s, and here lies before you The Church of God… what will you do? (This will be up to you). Maybe we can sum it up this way, remember Paul when Christianity was in its inception or infancy? He was in the religion of the Jews but when God called him to be in The Church of God he did not hesitate to follow. Jesus himself declared that He will gather His sheeps in one fold. [i]And other sheep I have, which are not of this fold: them also I must bring, and they shall hear my voice; and they shall become one flock, one shepherd. What are you waiting for BROTHER SCOTT? 😀 I am not urging you to make a hasty decision, it is still up to you to make THAT important decision. We’ll all be here waiting to celebrate and rejoice upon your arrival! HOPING IT WILL BE SOON! friendly advise to you, please keep on visiting bro.eli’s blogs and website, be open minded, keep on reading and listening to his preachings, then you will find the truth that you are searching, keep in touch to bro. eli . TO GOD BE THE GLORY! Hi Scot Fogg, Im the member of church of God. you can invite your brother in faith or friend to share there opinion for you too have a companion and to depend there faith. This is really important to us to seek first or to study which is the true church before you can spent a time in many other way of worship that was come from man. and may the God bless you always. to start.i have posted your reply below. i am sorry scott,you wont really understand IF you dont scrutinize deeply what i have written and said.if only you would scrutinize my message….ONLY THEN…you will find out,THAT WHAT I HAVE WRITTEN AND SAID… NEVER CAME FROM ME…IN FACT THOSE WERE IN THE VERSES.GOD SPEAKS THRU CHRIST AND THE PROPHETS,AND APOSTLES,THAT CHRIST SENT.We are merely giving out the verses. thats why we speak in verses and ECHO WHATS INSIDE THE VERSES…That people might understand with GOD’S HELP.We are not above these things written…we merely point out what is written….we have learned the discipline of being followers of CHRIST…JUST AS PAUL STATED, TO WHICH BROTHER ELI ALSO IS TEACHING US FAITHFULLY TO THESE THINGS WHICH ARE WRITTEN. ISNT IT SO CLEAR?DID SDA FOLLOW GOD’S WILL?OR THEY DEFIED CHRIST BY FOUNDING THEIR OWN? And now,to STRAIGHTEN the statement THAT I WAS CRITICIZING THE FOUNDERS OF SDA….IT IS PAUL WHO EXPOSED THE WRONGDOING OF THOSE WHO FOUNDED THEIR OWN. ROMANS 10; 2For I bear them record that they have a zeal of God, but not according to knowledge. NOW,is there any righteousness in founding another church for GOD?NAY…….IT IS IN VAIN!I hope this is already clear to your mind,…with GOD’S HELP. 2 tim 3:15And that from a child thou hast known the holy scriptures, which are able to make thee wise unto salvation through faith which is in Christ Jesus. And to be frank with you….the true church shall be the one to expose false teachings and preach the truth of GOD. AND THE CHURCH SHALL EXPOSE THE LIES THAT OTHERS MAY SEE AND BE SAVED…. LET’S OBEY GOD AND CHRIST.FOR IT IS THE WHOLE DUTY OF MEN. THANKS FOR YOUR KIND TIME,SCOTT and may you find the true CHRIST…..THAT MOST PEOPLE HAVENT FOUND YET.READ MORE OF BRO.ELI’S TOPICS…AND WITH GOD’S HELP…WE HOPE YOUR EYES SHALL BE OPENED JUST LIKE US.GLORY TO GOD!!!!!!!!!!!!!!!!!!! Q.DID THESE FOUNDERS OF FALSE CHURCHES HAVE FEAR OF THE LORD? IF THEY DID….WHY THEN ,DID THEY ESTABLISH THEIR OWN? 2For I can testify about them that they are zealous for God, but their zeal is not based on knowledge. 3Since they did not know the righteousness that comes from God and sought to establish their own, they did not submit to God’s righteousness. BUT IF TRULY ,THEY HAVE COME TO THE KNOWLEDGE OF THE TRUTH….THEN THEY MUST HAVE ABOLISHED THEIR CHURCH SINCE THEN. BUT WHY DO THEY STILL CLING TO IT?THATS ANOTHER THING TO PONDER. MAY GOD guide you…thru HIS WORD……THEY ARE ALL WRITTEN…WE CAN NEVER GO WRONG IF WE HEED HIS WORD. I do appreciate the time you’re spending reading this blog… May God also call you to HIS CHURCH- and I’m sure that YOU’RE VERY MUCH WELCOME, BRO. SCOTT! Bro.Eli you”re one of a kind. The greatness of THE LORD is seen in you. I will pray for you. God Bless…..
You are in the right direction Scott if indeed you are constantly seeking for the TRUTH. Having started a connection with Bro Eli will led you to it. One good start may be is for you to start defending or justifying your sda church. Your concern for women can not just be sidelined, but we can not help it if it its GOD’s will that they can not led. By not being leaders does not stop them from doing other very important roles assigned to them, just like many other men also. To each person is a ‘gift’. Not everyone can be an apostle, a prophet, a teacher and so on and so forth. Granting that the founders of the sda erred or did not have the right understanding of the WORDS in their early days, then there is plenty of room for them to change and correct the error along the way. They could have advocated for the corrections of their doctrine and joined the true church, the CHURCH OF GOD, the CHURCH mentioned many times in the bible as that known by HIS name. It is not pretentious to be in the CHURCH identified to be that of GOD, and where all true Christians therefore should be. After all, everyone have sinned, but it is a matter of accepting and asking forgiveness, and not to continuously defy the law and find ways to justify the mistake. ISAIAH 29:24 – THEY THAT ERRED IN SPIRIT SHALL COME TO UNDERSTANDING, AND THEY THAT MURMURRED SHALL LEARN DOCTRINE. Everybody, including the sda have all the chance to learn the TRUTH and correct themselves by joining the CHURCH OF GOD. I pray that you will listen more from Bro Eli, the same way that many of us who also came from differrent religions learned from the most vocal, straightforward, and most sensible Preacher of this generation, Bro Eli. WE PRAISE YOU AND EXALT YOU L,ORD GOD. Sorry for the error Scott, it should read ‘TO STOP DEFENDING’ not to ‘START DEFENDING OR JUSTIFYING YOUR SDA CHURCH. Based on the many testimonies supported by the undisputed Bible verses you received from the brethren, you are being called Scott, contact Brother Eli for the Doctrines and please bring with you the misled flock of sda to the true Church of God presided by Bro Eli Soriano. I for one of the many has been looking for any loophole or scapegoat to discredit Bro Eli as a true Preacher in his Bible Teachings and interpretations but I found none to this day. So many times I longed to challenge him in a one on one debate about the Scripture which I deligently read and searched supported by my research of the many religious beliefs of long ago to the present time but thanks God it did not happen because if it could have been, I could have experienced the big defeat and shame in my life. Would you believe that there was even also a point in time in my life that I have to prove the existence of God and the authenticity of the Bible to be God’s. Do you know to my surprise that before I read every Bible verse they already happend to me. At first, I said in my heart that it could have been a coincidence so I persisted and continued and God with His long suffering has been so kind to me when in so many ways beyond understanding demonstrated His Infinite Wisdom and Power for me to conclude that God is True, The Bible is True and the Church of God is True, the only one founded by God wherein Christ is the Head and where His flocks will be called. I am not expert in the Bible but I talk more on experiences with God’s Words in the Bible as expounded by Bro Eli Soriano who is the only one at this present time that can unseal the Book and express the hidden interpretations. With my previous doubts and unbelief it would be a great honor for me to be called the least of the brethren. Join Scott Fogg, your time is up before it’s too late. my sister in the lord, since it is said in the bible that women should not lead the church mentioned in the bible, well accept this fact. whether you are eve or not, no women are allowed to lead the church of GOD. period. there are numerous verses mentioning them. yet never lose hope, girls, ladies and women: because women can teach the word of GOD inside the church of GOD, not lead it. there are numerous female worshippers in the church of GOD yet not one female led the congregation. we can say that there are judges like deborah yet she led the people of israel TEMPORARILY, NOT PERMANENTLY because there is still no king in israel on that time. this can be applied with samson and gideon yet these three know that their leader is GOD himself who is known in the bible as a HE! you see, since girls can’t lead the church of GOD it doesn’t mean that girls can’t teach GOD’s words! everyone can teach the word of GOD, even girls can too yet leave the leading to the boys. ask bro. eli about you doubts via chat or questions, through him, GOD will soothe your soul using verses from the bible. GOD BLESS and Take Care, my sister in the lord. what a very low theology Mr. Soriano has! thanks be to GOD for sending Bro. Eli in our dispensation. All blogs in this site are sensible and worth reading. Although there were disagreement on other commenter, the word of God is crystal clear and the truth always remain. To God be the glory!!! Indeed! as it is indicated in 2 Chronicles 7:14, His people, which are called by His name. If a religious sect named after or named by man, it is the church of his own and not by God. So why renounce from using the Church of God, (which is also written in 1 Timothy 3:15) if it is in His congruence?